Justice League Dark keeps hitting the ball out of the park issue after issue, and the latest effort is no let down. The main storylines all advance in this one, so we get to see Wonder Woman and Zatanna meeting up with Circe, Detective Chimp opening the gates of Myrra, and Etrigan making his move. The largest part of the tale deals with Dr Fate and the Lords of Order, as Khalid explains how things took their dark turn with the ancient heroes. And, as I have been before, I am trapped between babbling on about the plot, or just gushing over how much fun this book is to read. Tynion loves getting as many characters into these issues as he possibly can, and quite a few get mentioned by Khalid when talking about the Lords of Order, some obscure characters, like Extrano, who wouldn’t be missed if they never returned, but are still nice to see acknowledged. And, as always, the art in this is superb. I love the Escher-esque interior of Dr Fate’s tower in particular. What else can I say? Detective Chimp gets the scene stealing lines. I am very glad to see Khalid being developed. I quit enjoyed his run as Dr Fate, and hope he gets to play a significant role as the series goes on. 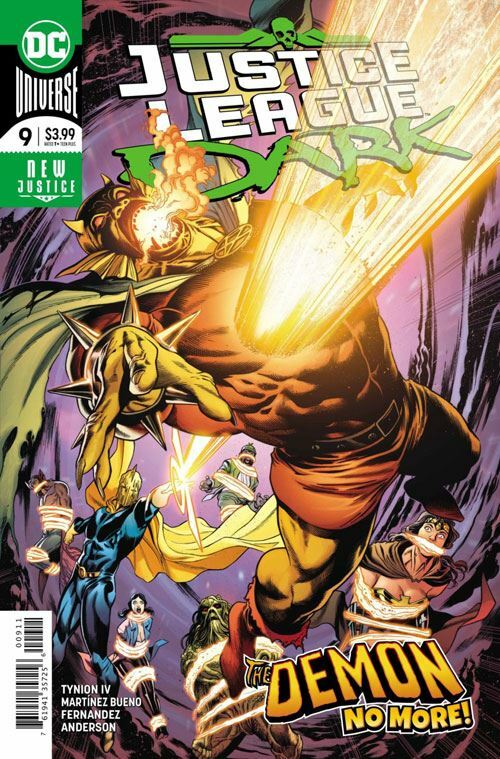 Etrigan burns up the pages he is on, almost literally. It’s clever, funny, makes the most of its concept, and is a damn good read. What more could you want from a book?